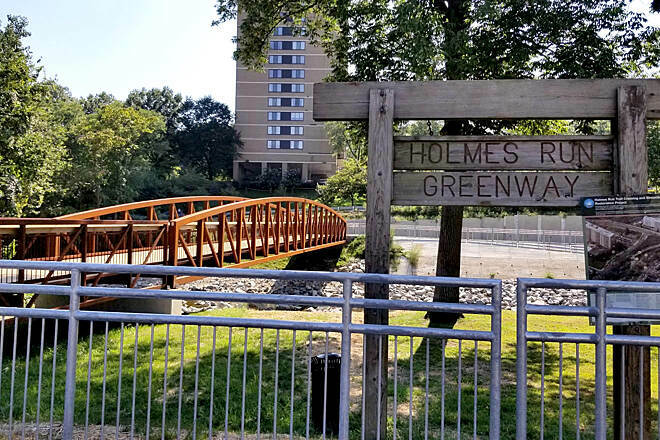 The Holmes Run Trail offers a scenic pathway through the heart of a busy residential area in Alexandria and adjoining Fairfax County, both suburbs of Washington, D.C. 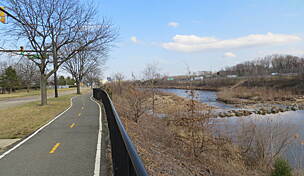 The trail, which is divided into two disconnected segments, is popular with bikers, joggers and parents with children. 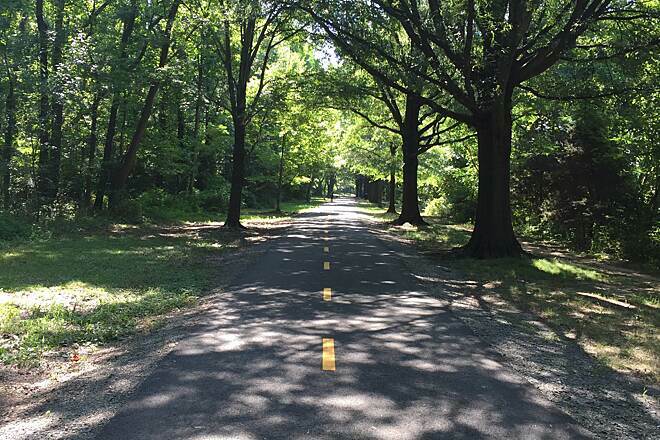 The paved trail begins adjacent to Cameron Run Regional Park and Great Waves Waterpark in western Alexandria, where you can connect to the Eisenhower Avenue Trail to reach Hoffman Town Center and the Eisenhower Metro Station. 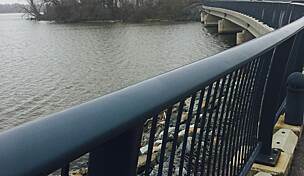 From that juncture, Holmes Run Trail heads northwest along a small stream, where you're likely to see geese and other waterfowl, and past Ben Brenman Park, which offers a playground, restrooms, picnic areas and parking. 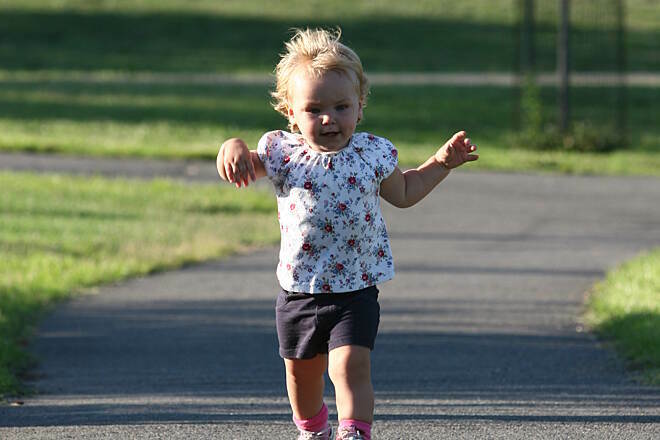 On the west end of the park, you can hop on Cameron Station Linear Park, a pleasant tree-line paved trail, to reach the popular Armistead Boothe Park with its sprawling playground adjacent to Samuel W. Tucker Elementary School. 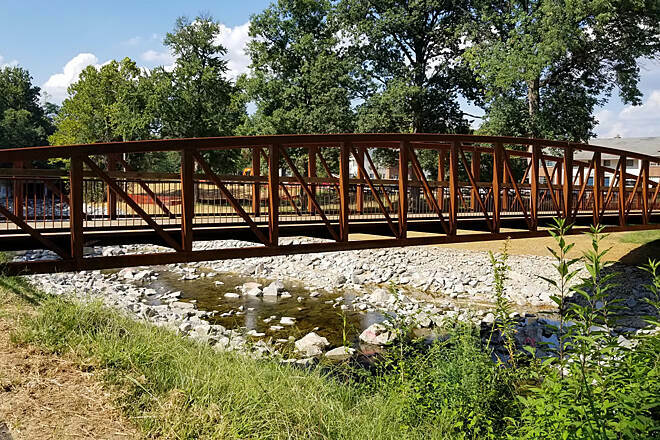 You’ll pass through some fairly heavily wooded sections until N. Chambliss Street, where a new bridge carries trail users to Glen Hills Park on the west side of Holmes Run. 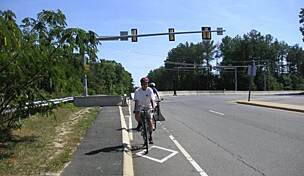 From there, the paved trail continues north to its endpoint at busy Columbia Pike (State Route 244). 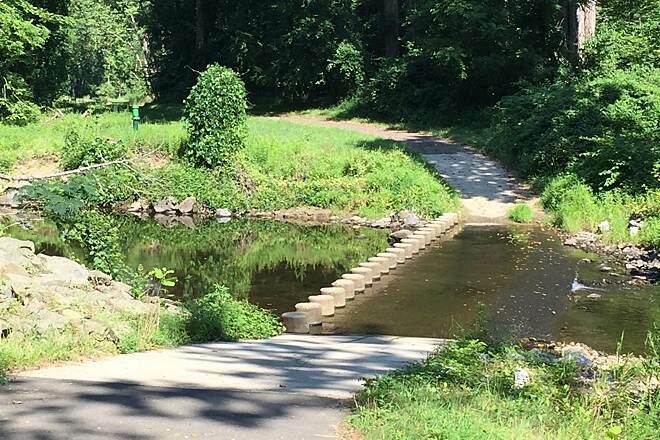 Separated from the longer stretch of trail by scenic Lake Barcroft, the northern segment begins at Sprucedale Drive (west of Sleepy Hollow Road) and follows Holmes Run to Hockett Street (off Annandale Road/SR 649) in West Falls Church. 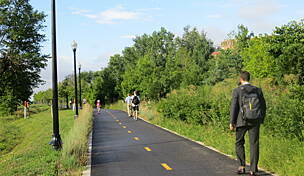 While portions of the trail are paved, the majority has a stone dust surface popular with runners. At the southern portion of the Capital Beltway (Interstate 495), take exit 174 (Eisenhower Avenue Connector). At the intersection with Eisenhower Avenue, turn right (east) and proceed approximately 0.5 mile. 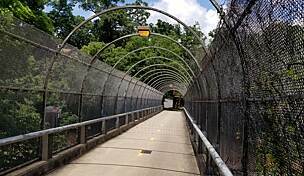 You’ll see Cameron Run Regional Park and Great Waves Waterpark on your left. Pull into that lot and park in a designated space. From the parking lot, walk west approximately 0.25 mile. 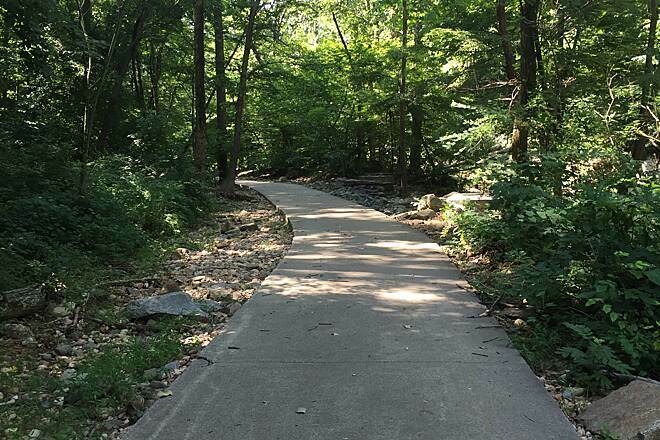 On the west side of the Vola Lawson Animal Shelter, you’ll encounter the southern trailhead for the Holmes Run Trail, adjacent to its namesake creek. 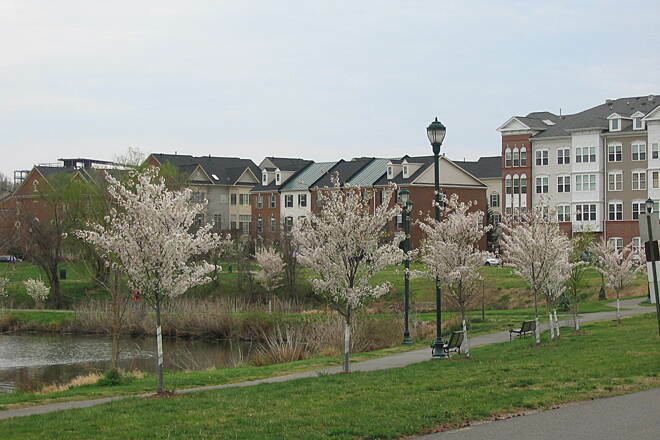 Parking and public restrooms are also available in Ben Brenman Park (4800 Brenman Park Drive). For the northern segment, park in Rose Lane Park's small parking lot on the northern end of Rose Lane in Annandale. 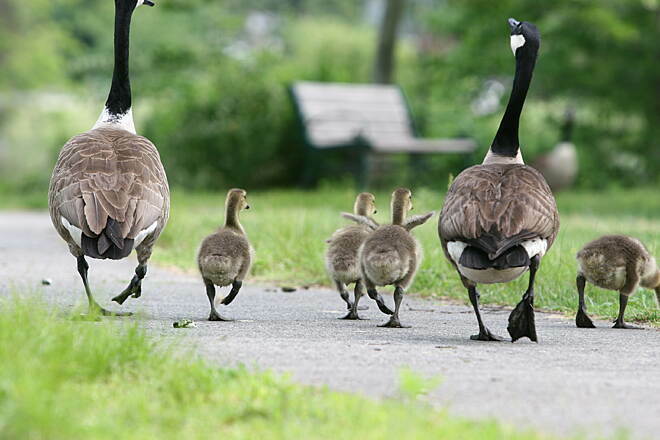 The Holmes Run Trail is a family favorite. 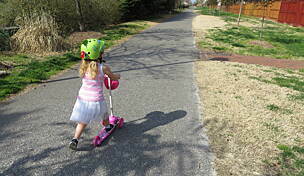 We like to ride from Ben Brenman Park, head north for a mile, and turn around. 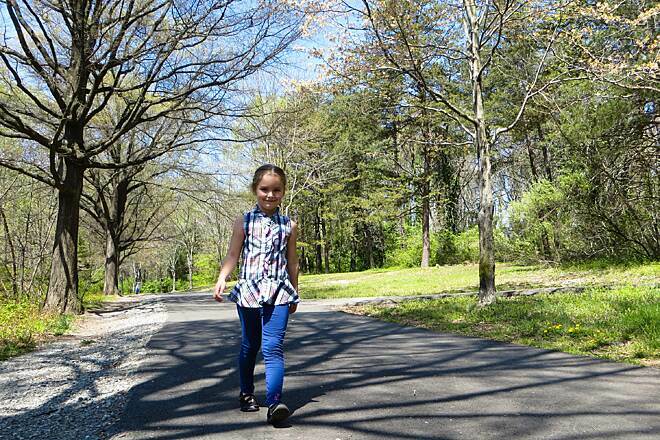 It's a pleasant, easy route lined with trees—and playgrounds! 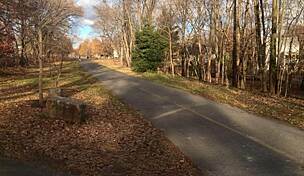 This section also has no street crossings (the trail goes under busy Duke Street), so it's safe and comfortable for young children. So much potential, but reeks of sewage after a big rain. Also had an unexpected closure at Bearegard St. Do a web search for 'Holmes Run water quality' to see some of the issues that aren't being addressed. Finally rode part of this trail after all these years. 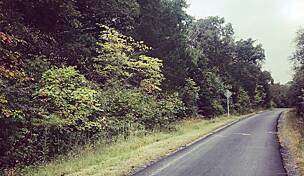 Was pleasantly surprised by the amount of shade and vegetation along the part I rode, from Eisenhower Ave. to No. Pelham St, where I turned around. On a Friday afternoon, there were few people, if that appeals to you. 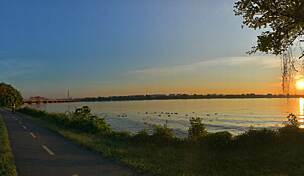 Pretty much had the trail to myself, altho it was nice to see a person now and again so you don't feel too alone. 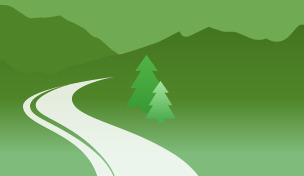 It is hard to find a scenic trail that is paved, relatively flat and wheelchair accessible. This was perfect for my son who uses a manual wheelchair with power assist. He needed a little help at times on inclines. 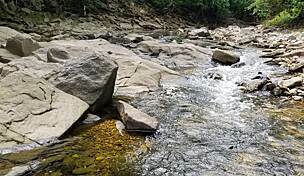 This trail has lots of shade and several wet stream crossings - the splash will cool you down. There are a few small hills, but nothing too strenuous in the heat. There are many trail off-shoots, but if you follow along Holmes Run, you won't go wrong. Its covered by thick vegetation throughout and pretty flat lands. Lots of bikers use it but its great for running as well. 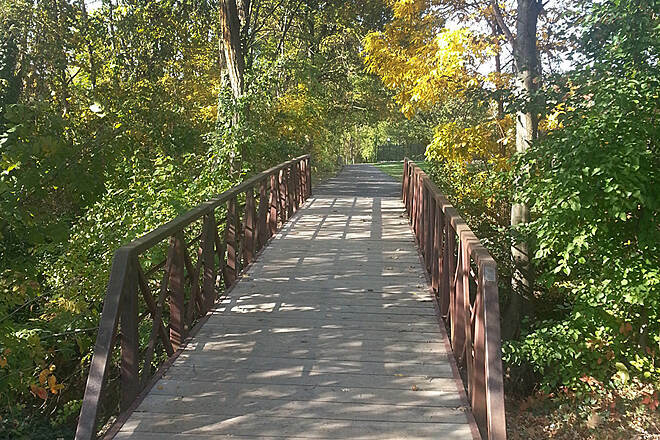 It's so pleasant running with a small creek and for naturists/runners this is highly recommended. It's asphalt from beginning to end. But no access to water fountains.